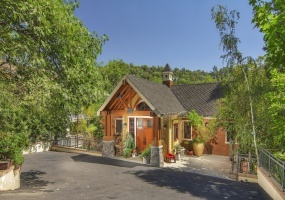 Lake Arrowhead Vintage Lakefront Estate - The illusion of total seclusion within this 1.7 acre Share of Paradise. A Stunning Lakefront Estate featuring Craftsman Style, Separated Guest House, & Single Slip Dock with Dock House! This home is a turnkey dream on the pristine, sought after & calm waters of the North Bay! Vaulted ceilings, walls of windows, a dreamy master suite, timeless kitchen, and ample space for your guest & entertainment needs. Gorgeous North Shore Lakefront with huge deck overlooking the lake. Exceptional Quality Remodel Using High-end Materials And Appliances. Hardwood Floors, Sky Lights, & Custom Decor. The Huge Dining Area Overlooks The Spacious Living Room And Out To The Deck & Lake. Great Separate Family/Game Room. Secluded Master Suite With Fireplace & Private Deck. Lakefront Family Home on Sought-After West Shore Road. Special Features Include: Level to street 2 car garage access with space to improve below - Five bedrooms, 4. 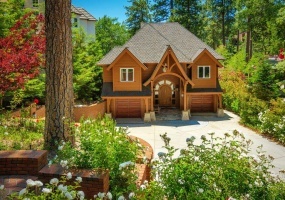 Lake Arrowhead Living at its Best! Lake Arrowhead living at its best. This absolutely charming Lake Front property still has all its charm and character as it did when it was originally built. Just a few steps to the front door. Walk into the living room with vaulted ceilings, a soaring fireplace, with a cozy dining room area. Kitchen has been remodeled with hidden built in refrigerator, freezer and dishwasher. Lakefront Lot Listing - WITH Dock Built Out! Build your dream home on the shoreline of sought after Emerald Bay! This rare lakefront lot is a steal, and already has a built out dock slip! Typically, that would be impossible, but not for this opportunity. That is a lakefront lot in Emerald Bay of beautiful Lake Arrowhead with an already built out dock slip! Plans are also available for those who are looking to make a quick project.